I wouldn't make it a day. I loaf a lot myself. I suspect you are exaggerating Joanne. And deserve loafing/recuperation time. Joanne; I'm doing a fair bit of loafing myself. I find myself agreeing with EC here, you deserve some loafing time. only slightly confused; I thought so too. Elephant's Child; I've tried sourdough and maybe I've tried the wrong brands, but I didn't like it. But I've been married to a sourdough, didn't like that either. I suppose he thinks he's the greatest thing since...himself! Val; isn't that the default of all men? Sour or not? 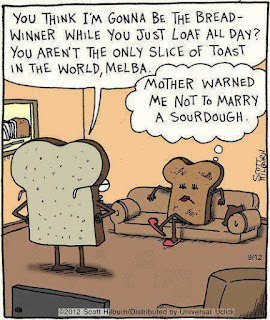 Andrew; I thought you'd laugh at that and the Melba toast too.